Literature: Listed in Aubrey Noakes' "Ben Marshall" (Leigh on Sea 1978) number 69 page 36. Benjamin Marshallwas born at Seagrave in Leicestershire. He worked initially as a schoolmaster, and seems not to have taken up painting until about 1790. He was introduced in the following year to William Pochin Esq., the local member of parliament, who in turn introduced him to his first Master, the portrait painter Lemuel Francis Abbot. Marshall's progress was rapid, and by the middle of the 1790's he was being patronised by HRH The Prince of Wales. 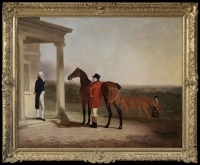 Marshall was at his artistic peak in the years 1798 to 1810, and the paintings produced from his brush during this period rank with the very greatest works of the English School of animal painting. The present painting is entirely typical of his dramatic use of local colour and vivid drawing. The present Shrivenham House, built 1831, still stands and is today the campus of the Defence Academy of the United Kingdom, which is a military and academic community providing postgraduate education in strategy, leadership, management and the application of technology to defence. It is part of Cranfield University.